Rakuyaki (楽焼) or Raku (樂) is a form of Japanese pottery characterized by low firing temperatures (resulting in a fairly porous body), lead glazes, and the removal of pieces from the kiln while still glowing hot. In the traditional Japanese firing process, the pot is removed from the hot kiln and put directly into water or allowed to cool in the open air. 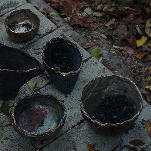 Raku is considered the traditional method for creating bowls for the Japanese tea ceremony. Raku tea bowls are hand-made from earthenware, each with a unique shape and style. 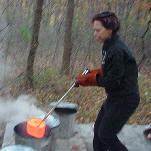 Raku techniques have been adopted and modified by contemporary potters worldwide.